This small recessed LED Light has the diameter close to the size of a quarter. Designed for use in indoor and outdoor applications. Also a great low profile cabinet light. Choose the Matt Clear trim housing for a special glow that emits through the whole housing, instead of just through the clear glass lens. Can be used directly off of 12V DC batteries for use on boats, yachts, RV's as a LED courtesy light or as a livewell tank LED light. 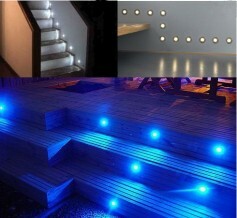 Applications Include: Step Lighting, LED pathway lighting, Deck Light, small recessed cabinet light, post light and so on. -Interchangeable Trims, avaivalable in various colors including White, Black and Brushed Nickel. Cut Out Size Diameter: 1.25"
-Versatile Size that can be used in virtually all situations that need a small pathway light. -Great for use with Solar Power or on Boats and RV systems directly off of 12V DC batteries.